Warangal District is a major producer of cotton in the state of Andhra Pradesh. There are about more than 400 Ginning Mills in and around Warangal. In each Ginning Mill about 150 people work in shifts of 12 hours each. In each mill the workers are mostly women and children. It was found that at least 45 to 50 girl children are found working. They earn Rs.50 to Rs.70 if they work for 12 hours and it all depends on the availability of power as their wages are cut if the power goes. If a bag of cotton is opened and segregated they will get Rs 1.70 and this cotton is fed into a machine which segregates seed and cotton. As the Girl children have more patience they are used for this process. We can see in the photographs, the girls have to work in the most hazardous conditions. That’s why they all suffer from lung and chest diseases and ear problems as they are continuously in high decibels of sound. Most of the girls are drop outs and sometimes entire family works in the mill living in small huts in the premises of the mill. The girls after putting so much hard work get nothing as the entire money goes to the family needs. When Tharuni approached the managements of the mills, they said they are aware that children below 14 years cannot be employed and is illegal, but they are brought by their parents. Parents say that the girl children have to support the family as the agriculture is not supportive and that is the reason why they are migrating. Parents show lot of discrimination and they bring only their girl child for work and retain their male kids at their village to attend schools. The girls are made to work at home and also in the mill. All the girls who are working in these Ginning mills have to be streamlined and health facilities are to be provided as early as possible. Strict warning has to be issued to the managements of these Ginning mills not to employ children in the mills. Parents have to be counseled to join their daughters in the schools. As school is the right place for children. Gurram Venkata Ratnam and Rajamma has three daughters, Swarna, Sandhya and Sravani in the age group of 15, 10 and 7 years. All the three girls work in the Brick factory and all of them are drop outs. They work for 10 to 12 hours a day along with their parents and all are suffering from anemia. They work in the dusty, polluted work areas and near hot chimneys and get frequent head aches. Their parents are sending their son to school and feel that girls have to work. Nireti Vasantha is a 5th class drop out is 13 year old and has been working in the brick chimney since four years. These are the few cases of hundreds of such children working in this industry. They are preparing bricks for our house construction but unable to construct their lives. On the either side of the Hyderabad – Warangal High way we can see many Brick chimneys where we can see hundreds of children working in the hot sun. Most of the children are drop outs and some work in their school holidays. All the children are between the age group of 8yrs to 18yrs. Most of the children are girls as their wages are low. Each girl will carry one thousand to two thousand bricks every day. She earns Rs.40/- for thousand bricks. She has to work 10hours in a day. The girls who works near the chimney may earns Rs.300/- along with her two more family members. 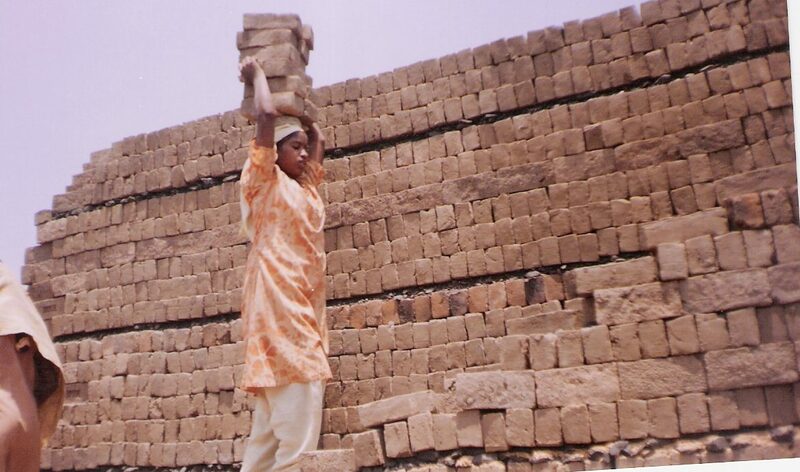 In each brick chimney about 45 girls will be working. Most the girls want to pursue their studies and parents want their daughters to be accommodated in some hostels. Brick by Brick – Please build a beautiful life for us. See how tall they are climbing – but not in life! Sister let us do our elder’s job – But they are forgetting their job. How long is this drudgery?